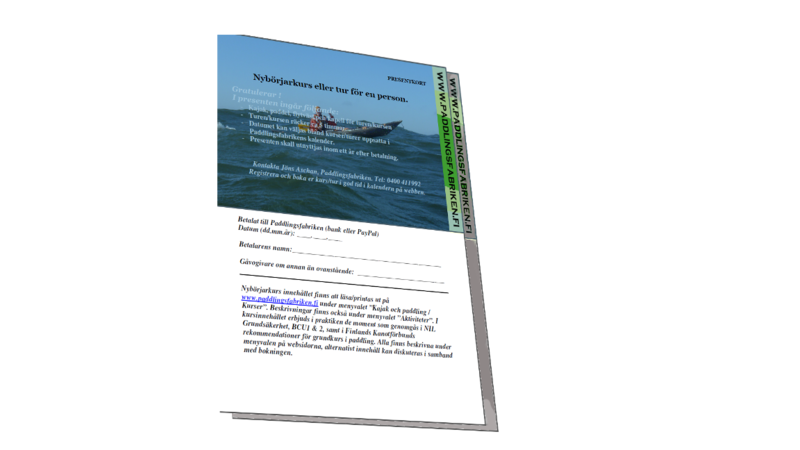 Gift card that is valid payment for a year forward for services delivered by Paddlingsfabriken. The holder of this giftcard can pay for Paddling classes or Paddling tours for the value stated on the card. Ie. 100 Euro. The card should be used within one year of purchase. Nybörjarkurs eller tur för en person. - Turen/kursen räcker ca 5 timmar. - Presenten skall utnyttjas inom ett år efter betalning. Registrera och boka er kurs/tur i god tid i kalendern på webben.